How do you separate the professional installers from amateurs? You might guess customer service or attention to detail, but more often than not, experience is the clear determinant. Not all installations are the same, that's for sure. Following are some of the most common installation mistakes we see have seen. Obviously, this is why we recommend experienced pros, and certainly never recommend self installs. The potential for having one of these mishaps is real. Take a look and have a laugh. Then call us to get your install right. Artificial Grass Pros has been around the block a few times. We know how to get the job right the first time. Lumps, bumps, ripples, waves and swirls… we have seen it all. The problem with this one is people tend to think of artificial grass as very forgiving. It is not. You would never dream of installing carpet over an extremely uneven surface. Artificial grass is no different. Any imperfection will show up in the lawn just as it will with carpet. The solution? Proper base preparation. Experience will prevent this common installation mistake. The surface has to be free of large rocks and other debris that might create an imperfect surface after installation. Our team has the skill set and experience to get it right the first time. This is one area where taking shortcuts simply will not do. You might be surprised to learn this is one of the more common installation mistakes. Installing a weed barrier should be a no brainer. The whole point of an artificial grass lawn is to never fight weeds again. You want to enjoy a lush green lawn free of pests, weeds and the maintenance involved to make it so. However, you must have a weed barrier installed to enjoy this benefit. This is why we don’t recommend installing the turf yourself. There are too many things that could go wrong. Weeds sprouting through your artificial lawn is just one of many. This is one of the common installation mistakes that can really impact the aesthetic look of your lawn. It can also be costly to repair (another reason we do not recommend self installs). It does no good to lay the perfect base and get the drainage right only to end up with unsightly joints in the end. The cure is obviously Artificial Grass Pros. We get it right the first time. Your joints will be hard, if not impossible to spot! If you have driven past a yard, after a good solid rain, and noticed standing water on the artificial grass, you are witnessing a drainage issue. This common installation mistake occurs when the base and infill are not thought through correctly. Weather is a consideration. If you live in an area that receives a lot of rain, enough sand and gravel are required to facilitate the draining process. Even in the Greater Bay Area, where drought conditions have prevailed for years, you can still find standing water on lawns if drainage is not addressed prior to the installation. This is why it’s best to use a professional. This occurs when the edges are not secure. It is also one of the common installation mistakes that can be easily prevented. Experienced installers will make sure your edges are nailed down to prevent them from curling. Artificial Grass Pros uses the proprietary “edge securement” system. 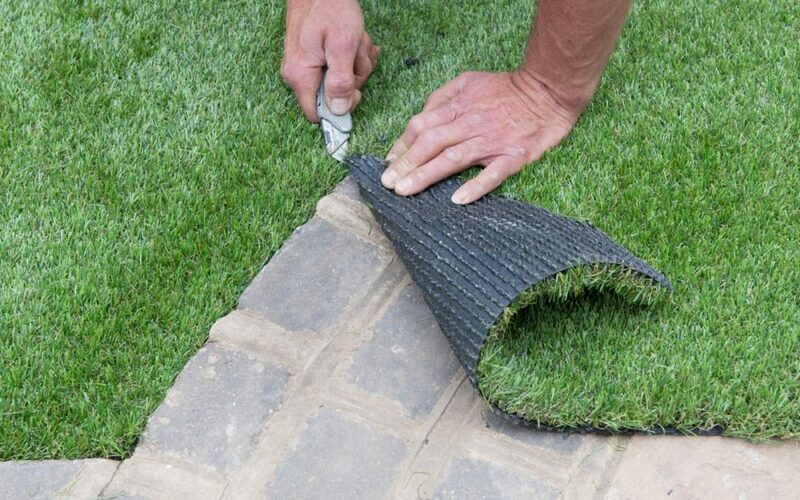 When artificial grass curls, it presents a host of problems. Often times, it is harder to secure the edge the second time around, plus water and debris can works it way underneath causing damage. It is imperative that this is done right the first time. Curling edges are one of the more costly repairs to address. Many installation companies are experts at installation, but all of the expertise in the world will not prevent wear and tear due to improper selection. This is where Artificial Grass Pros is a real benefit. We own NewGrass, an artificial grass product company. We can help you choose a product that fits your lawn best. The worst installation mistake is choosing the wrong type of grass. If you choose a type that does not stand up well to daily wear and tear, you might as well be flushing money down the drain. You may also have the opposite problem. Artificial grass overkill is a plague of a different kind for your wallet. You want a product that looks amazing, without being too convincing. You also want it to be durable. We can help you choose a product that suits both your budget, and aesthetic needs. If you want to avoid these common installation mistakes, there are a few things you can do. For starters, you can vet your artificial grass installation company. Ask them about their install process, experience and the types of obstacles they have encountered. Also, ask to see their portfolio and get references. The more info you have the better. You can call us. We have some of the most experienced installers in the business. Our team has performed installs on everything from small residential projects to large corporations like GoDaddy and Google. They know how to navigate tricky areas and make your lawn look fantastic. It all begins with an initial consult We will take time to make sure we adequately understand the goal of your install before we do anything else. Once we know what you are looking for, we will work with you to create your dream space. After the install you won’t have to worry about loose joints, bumps or curling edges. Instead, you can enjoy all the benefits that come with an artificial lawn. No bugs, low maintenance, easy to clean, no mowing, these are just a few. Choosing AGP is the best way to ensure a top notch end result. We have a 15 year warranty and a track record that can not be beat.Give us a call and see how we can help today! You won’t regret it!.